Explosions in the Sky; being a band that generates narrative-styled instrumentals, I always seem to think that their music would suit perfectly to serenade a brief siesta. It usually would work during the first few seconds, but when the guitar hooks starts getting heavy, going uphill to reach its climax, it transforms into something ominous, sinister even, startling you from your midday reverie. I guess I overlooked upon the fact that though it may be instrumental, the compelling sense of post-rock shimmers is blatantly tangible. 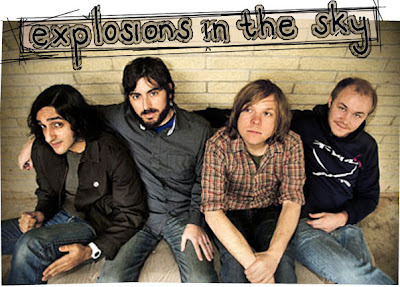 Explosions in the Sky is a critically acclaimed instrumental post-rock band originating in Texas, United States. Though frequently tied to the post-rock category, the band dismisses this role-name and sees themselves as none other than simply a rock band. As many have claimed before, EITS makes some of the most moving and emotional instrumental music you’ll ever hear without a full orchestra. Take for example, ‘Welcome Ghosts’, their second shortest song in their latest called, All of A Sudden, I Miss Everyone. Overwhelming soundscapes alternated with trembling strands of silvery guitar lines, with an intense rhythm that grows steadily throughout the music - quickly proving itself as a ‘good listen’, owing to its atmospheric quality and majestic feel.